The Model DC2480™ Knee CPM delivers an extended range of motion within a compact design that is ideal for any protocol. Boasting a range of –10 to 120 degrees and a sleek open carriage, the Model DC2480™ caters to the versatile needs of patients and providers alike. Durable, mild steel construction allows the DC2480™ to accommodate home and hospital environments, while the easily understood control pendant provides reliable functionality. All Furniss Corp knee CPM models feature a unique space saving tripod position to reduce contamination and provide a convenient storage option. Durable, mild steel construction allows the DC2480™ to accommodate home and hospital environments, while the easily understood control pendant provides reliable functionality. 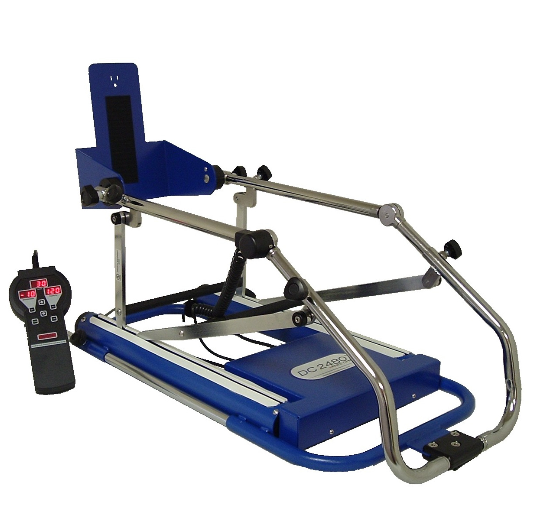 All Furniss Corp knee CPM models feature a unique space saving tripod position to reduce contamination and provide a convenient storage option. At just 27 inches long, the Model DC2480™ is proof that great things do come in small packages.